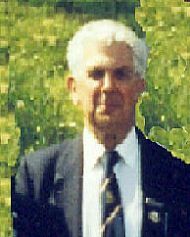 The following club history was written several years ago by the late Reg Simmons, who was a member of the Club for many years. This was not intended as a History of Hailsham Bowling Club; but with the influx of new members and with one or two remarks heard about cramped conditions etc in the Club House it soon became obvious that very little is known about the history of the present Club House (not the changing rooms and toilets — they will come later). So if you will bear with me I will try and give a resume. 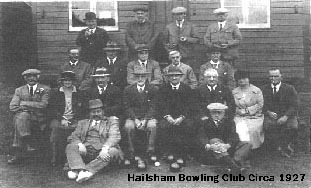 HAILSHAM BOWLING CLUB was formed in 1923. The green was situated on the land between the rear of the Crown Hotel (now the Corn Exchange) and the back of the Cottages in North Street opposite the old Post Office (now the Sorting Office). In other words it is now buried under the present Quintins car park. The green was originally owned by the Star Brewery, Eastbourne and leased to Hailsham Bowling Club for a Peppercorn Rent, the reason being, I suspect, that one of the Club members was a Director of the said brewery. Time marches on, the Star Brewery was taken over by Courage Brewery who after long protracted negotiations leased the green to the club. It is worth remembering at this point that we are talking about a small club with an average membership of not more than 50. In early 1980s there were plans being aired for the redevelopment of the Hailsham Town Centre and in due course these came to fruition. It was proposed that there would be a new shopping complex and car park now known as The Quintins. One snag —Hailsham Bowling Club. They still had 12 to 18 months of their lease to run. As you can well imagine there were numerous lengthy meetings between all the interested parties, with the net result that the present site was finally agreed. Our thanks are due to the untiring efforts of Life Member Stan Hawks and the then Club Captain the late Joe Munn for seeing it through. Wealden District Council purchased the ground from a local farmer. In the meantime the Town development got under way and Hailsham Bowling club was without a green while the new one was being built,.if you look at the Honours Board in the Clubhouse you will see that competitions were not played during 1985/6. However, thanks to the kind co-operation and goodwill of our neighbouring clubs, play in a limited manner continued for the following 12 months or so on their greens. At last the great day arrived — 25th May 1987. All the necessary paper work had been completed with Wealden District Council who had leased the green to us on a 28 year lease at a nominal rent. The Club House and green were officially opened by the Mayor of Hailsham the late Councillor Ron Harmer. Remember the Club House at the time was built to accommodate about 50 members. Now step inside and walk down memory lane with me. Most, if not all of you, know about our latest extension which was paid for from members interest free loans and for which we worked hard to repay and managed to return all monies by 2005. But in 1987 you would have been confronted with a pure basic HUT. The kitchen as such was practically none existent, consisting of a sink (not where it is now) and a power point for a kettle. This small room was made even smaller by the intrusion of a large wooden box which contained the electric water pump for the automatic watering system. In addition to this because of the lack of storage space the mower, mats, score boards and other ancillary material had to be stored in the club house. However with the fullness of time the facilities began to improve. As a starter a Greenkeeper’ s hut was built by members of the club under the supervision of the late Harry Wood. This was opened in October 1990 thereby enabling all the maintenance equipment to be stored in a building other than the club house.. The next objective was the removal and resiting of the electric pump. Bill Gorringe, the then Captain was the main stay behind this and when completed led to the redesign and enlargement of the kitchen space. A costly process, again covered by member’s loans. The equipment store near the entrance gate came later. Before leaving to another part of our History, Harry Wood also installed Locker Seats around the walls, a useful addition in those days but it did reduce the floor space. It seems somewhat unbelievable now that when the ground was handed over to us in 1987 there was no provision made for toilets. So what were we supposed to do you may well ask? Well first of all don’t take too much liquid on board. If things however did get desperate it was every man for himself— but for the ladies, OH DEAR!. Ladies, now cast your eyes towards the old entrance gate, then cross the road and go up the fire escape to the Lagoon restaurant and PRAY that the door was unlocked or already opened. If it was, ‘Good’. Enter the building, use toilets and return. But if the door was locked and there was nobody to open it, then retrace your steps, walk right around the building and enter by the main door; how embarrassing. Well I am glad to say things did improve and in the meanwhile our enterprising Club Captain, at the time, Les Hallam, arranged to have installed ‘Thunder Boxes’, i.e. galvanised cabinets with Elsan buckets for which we paid the Green Keeper extra to empty. But I promise you things do get better. Obviously due to the increase in Club Membership, visiting teams etc things could not be allowed to remain as they were. Les Hallam had been working on the problem for a considerable time. His efforts were untiring in applying for grants for our organisation, getting plans drawn up etc. The net result of his hard work was that we received a grant from the Sports Council of Great Britain, which was a great help but did not cover anywhere near the cost of the building we now call the Les Hallam Changing Rooms (and toilets). We again asked for interest free loans from Club Members and once again they came up trumps. Good job they did for I can tell you there were some sleepless nights for some Committee members. Be that as it may the job was done, it might be small but when it was opened in 1994 membership had not reached 129. I think I have just about reached the end of my story, but I have this fixation about the Club toilets. It might be useful information for any future Building and Safety Officer in the Club. You may have noticed a wooden structure built on the rear of the changing rooms/toilets. It is of course locked. It contains a drainage pit and an electric pump which was imported from Germany. The waste matter is pumped from this pit via a pipe which runs in front of the building, underneath the paving slabs the complete length of the green up the bank at the far end, partly across the W.D.C. car park and into the drainage system. The original gateway to the green was quite a long walk for members carrying their woods from the lower car park. So in 2001 the Committee decided with the approval of the Council, to provide a new entrance which gives access to the bowling green direct from the lower car park. This short cut is much appreciated by members and our visitors."